I sometimes wonder why Facebook has emerged as that place in our culture where people feel the freedom to tell you exactly how they feel about politics. Most of my Facebook friends are professing Christians, primarily of the evangelical variety. Many of them love to talk politics. If I were to summarize the majority of their comments, links, comics, and memes on Facebook, it would go something like this: America is a Christian nation, we have lost our spiritual moorings, and political liberals are mostly to blame—but if we elect the right politically conservative (or perhaps libertarian) candidate, he or she (probably the former) will restore America’s greatness and perhaps usher in another Great Awakening. John Wilsey is one of my Facebook friends, but he doesn’t sound like this when he talks politics. He knows better. Wilsey, assistant professor of history and Christian apologetics at Southwestern Baptist Theological Seminary, is a scholar whose expertise is the intersection of faith, politics, and Christian interpretations of American history. His latest book, American Exceptionalism and Civil Religion: Reassessing the History of an Idea, is in many ways a tract for the times. It’s historically perceptive, theologically responsible, and hits on a topic that matters to ordinary believers. 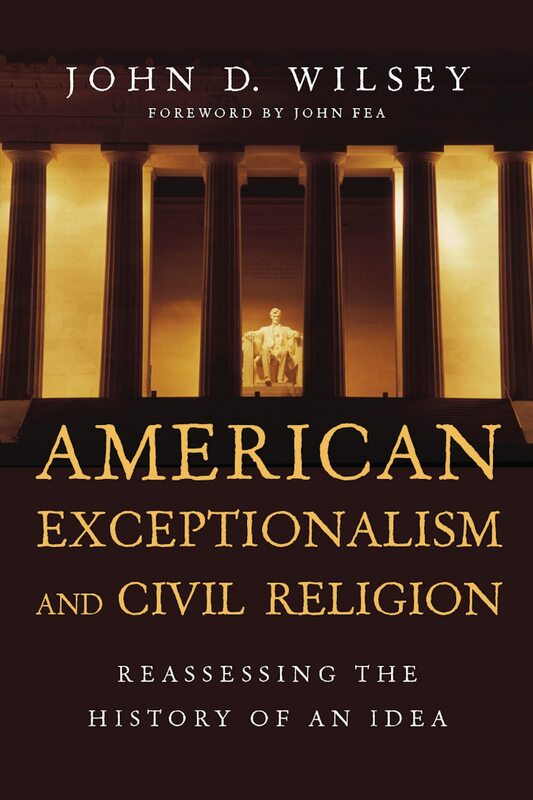 In American Exceptionalism, Wilsey examines the history of American exceptionalism and its intersection with the broader category of civil religion. He also offers a theological assessment of these interrelated concepts. His verdict: “a high view of American exceptionalism is, at significant points, at odds with the Christian gospel” (18). However, Wilsey doesn’t reject all forms of exceptionalism as out of bounds for Christians. He suggests that “American exceptionalism” is a phrase that can be interpreted at least two different ways. A “closed” exceptionalism exalts America at the expense of historic Christianity—even when advocated by believers. An “open” exceptionalism eschews problematic theological baggage while still fostering patriotism. Wilsey commends the latter approach to contemporary Christians. Wilsey begins his book with an introduction that lays out his thesis and provides background discussions of American exceptionalism and civil religion. Exceptionalism is simply the belief that America is special. It’s an elastic concept that can be understood in both benign and problematic ways. Wilsey defines civil religion as “a set of practices, symbols, and beliefs distinct from traditional religion, yet providing a universal values paradigm around which the citizenry can unite” (20). American exceptionalism is an aspect of civil religion, uniting citizens around a common sense of America’s special place in the world—and perhaps God’s sovereign plan. IVP Academic. 263 pages. $22. Wilsey suggests that civil religion is not inherently bad, but should never be conflated with revealed religion, lest it be used to deify the nation. Closed exceptionalism, which ascribes spiritual purpose to America, is an expression of the wrong sort of civil religion. Open exceptionalism, which is critical yet loyal, coincides with a more generic civil religion that promotes the best of American values while pushing back against problems in our history, culture, and national agenda. In chapters two and three, Wilsey looks at the origins and early development of both forms of American exceptionalism. The Puritans provided the seed for a closed exceptionalism when they explicitly imported theological categories into their colonization efforts. Puritan concepts then intersected with more secular forms of exceptionalism that arose out of the Enlightenment, resulting in a generically (Protestant) Christian republicanism. The result was a closed exceptionalism that suggested America was a Christian nation specially blessed by God, but also gave rise to problematic concepts such as Manifest Destiny and biblical justifications for chattel slavery. Politicians, preachers, and even historians drank deeply from this well prior to the Civil War, until the latter introduced a more open form of exceptionalism that wasn’t afraid to raise hard questions about American morality and even religiosity. Abraham Lincoln exemplified the emerging open exceptionalism. In the next five chapters, Wilsey recounts the historical development of five key theological presuppositions associated with closed exceptionalism, offering theological critiques of each. Closed exceptionalism assumes an elect people, commissioned to spread American values to the world, who are innocent of any significant wrongdoing (at least relative to her neighbors), who have been given a land to use however they see fit, and who embody what it means to be a Christian nation. This closed exceptionalism inappropriately ascribes biblical categories to America, which is interpreted as a new Israel. While closed exceptionalism has fostered a generically Christian sense of patriotism, at least until recently, it has also contributed to such national ills as racism, Manifest Destiny, and ecological recklessness. It has also contributed directly to how politicians and diplomats contrasted America with the Soviets during the Cold War and how many political conservatives continue to contrast themselves with liberals in the culture wars. In his final chapter, Wilsey commends open exceptionalism as an appropriate form of patriotism that rejoices in America’s strengths, recognizes her shortcomings, and does not conflict with Christian orthodoxy by ascribing a salvific role to the nation. He finds roots for an open exceptionalism in Justin Martyr’s posture toward the Roman Empire. In America, W. E. B. Dubois stands out as an exemplar of open exceptionalism. American Exceptionalism is well written and cogently argued. Wilsey does a fine job of working through recent scholarship on exceptionalism and civil religion, summarizing that material for a general audience, and scrutinizing it through the lens of evangelical orthodoxy. At several points along the way, Wilsey makes clear his own sense of patriotism, and he at least strongly hints at his conservative inclinations. Nevertheless, his role models for open exceptionalism tend to be more progressive (Lincoln, Dubois, Martin Luther King Jr.) while many of his recent examples of a more problematic closed exceptionalism are conservative (Ronald Reagan, George W. Bush). At times, it almost seems as if Wilsey is suggesting that the way forward for evangelical conservatives, at least on this issue, is to embrace some of the realism of progressives when it comes to America’s track record in matters of public justice. If I’m reading Wilsey correctly, then I expect his approach will ruffle the feathers of many evangelicals who tend to be partisan Republicans who at least imply there is a slippery slope from progressive politics to outright atheism. Nevertheless, these particular feathers need to be ruffled. As Wilsey’s discussion of American history textbooks written for Christian homeschool and private school students makes painfully obvious, many social conservatives have been catechized in the false gospel of closed American exceptionalism. If political polls are even generally trustworthy, this is evidenced in how (white) evangelicals are currently flocking to whichever Republican presidential candidate offers the most full-throated version of closed exceptionalism. Inexplicably, many evangelicals seem convinced that candidates who scoff at Christian orthodoxy and ethics are nevertheless God’s man to restore America’s greatness. Wilsey’s book is a timely reminder that believers must never render to Caesar what is owed to God alone. America is exceptional in many ways, and there is nothing wrong with affirming this conviction. But idolatrous forms of exceptionalism should be rejected as false gospels, even (especially?) when they arise in evangelical contexts otherwise committed to the full authority of the Scripture and transforming power of the good news of Jesus Christ. Perhaps Wilsey should consider serializing American Exceptionalism on Facebook.